What's the Future of Area Wind Farms? Wind-rich east Idaho has attracted a plethora of developers in recent years, and, as a result, wind turbines now dot several of the local horizons and carry the promise of many more to come. Bonneville County has approved requests for at least six wind farms in recent years, two of which are already in operation. Power County has approved two wind farms, which are both set for completion by the end of the year. Bingham County has approved at least four wind farms, and Bannock County has approved one. And even Shoshone-Bannock tribal officials are considering the idea of placing up to 90 wind turbines on the reservation in the next few years. As a result, East Idaho is quickly becoming a wind energy corridor , but controversy surrounds the turbines, and many residents are left wondering what the machines mean for the region's future. The answer isn't very clear. Developers say the wind farms provide a green, inexhaustible energy resource, as well as jobs for residents, extra money for landowners and much needed tax revenues for counties struggling to make ends meet during a difficult economy. But some residents are worried about the impacts the machines will have on their lifestyles , environment and power rates as they watch the turbines popping up all over the region. Anyone who lives in East Idaho knows there is plenty of wind here, and that fact has drawn a lot of developers to the area at a time when construction has slowed due to the difficult economy. Rockland Wind Farm located between American Falls and Rockland, often purchase local goods to give area businesses a boost. Jay Williams, who is managing the Rockland Wind Farm for Ridgeline Energy, said the 44-turbine project has pumped millions of dollars into the local economy. They've purchased fuel and gravel from local businesses , and many employees are staying at RV parks in the area, he said. "Rockland Wind Farm personnel also contribute to local restaurants, motels, local stores, gas stations, apartment rentals, tire and automotive services and a few home rentals," he said. Wind farms also provide financial benefits for landowners who are willing to let the developers place wind turbines on their properties, and there's monetary gains for school districts, emergency services , libraries and other taxing districts, too. Although they don't pay property taxes, all of the wind farms in Idaho pay a gross receipts tax, which is 3 percent of their total electrical sales revenue. Ross Stephenson, senior appraiser for the Idaho State Tax Commission, said Idaho's nine operating wind farms paid more than $1.6 million in taxes last year, all of which went to help taxing districts in Bingham, Bonneville , Twin Falls, Cassia and Elmore counties. And he said many more wind farms will add to that tax revenue next year. Williams said the Rockland Wind Farm, which will completed at the end of the year, is expected to contribute between $308,000 to $450,000 a year in taxes for the next 25 years. But even though counties receive extra money from wind farm projects, residents don't necessarily get any tax breaks as a result. The money isn't added to the levy and doesn't decrease taxes -- it's just "gravy money" counties get to add to the budget, Stephenson said. 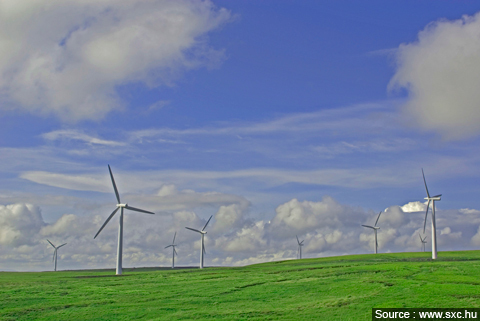 In addition, wind farms can actually drive residents' power rates up -- at least initially. Wind may be an inexhaustible resource, but it can also be an unreliable one and that presents challenges when it comes to utilizing the energy, said Mark Stokes, power supply planning manager for Idaho Power. "Wind-generation projects provide energy to Idaho Power only when the wind is blowing. In our local area, wind is very unpredictable and the time the wind is blowing is typically not when Idaho Power is experiencing peak energy demand by its customers," he said. As a result, the company has to have additional resources to ensure the required power is available even when the wind is not blowing. And that can impact customers' bills. "The addition of wind generation has not only put upward pressure on customer rates due to the actual purchase price of the wind energy, but the increased costs of adding additional generation resources to back up the wind generation is also borne by our customers," Stokes said. Idaho Power isn't antiwind energy, he said, adding that about half of the company's power comes from clean energy sources, including wind, hydro, solar , biomass and geothermal. But wind, which isn't as reliable as the others, has caused some difficulties when it comes to using it. "Integrating wind energy into the grid that brings power to our homes requires facilities that can quickly adjust to momentto-moment fluctuations in wind activity," he said. "Unfortunately, traditional generating plants can take hours to come online and off, so they are not suited to the task." But developers also pay close attention to the amount of wind that is typically produced in the area, since they know they will have to meet their obligations to the power companies and investors. Williams said they collected wind data for more than 10 years before deciding where to place the Rockland Wind Farm turbines, which should add to the project's viability when it begins operating later this year. Wind energy is an inexhaustible resource and it can be "harvested" without making significant changes to the land around it. For instance, the Rockland Wind Farm will impact less than one percent of the 15,000 acres it covers, Williams said. The wind farm is expected to generate enough power for 37,000 homes without significantly impacting the land or farmers who work in the area. "Wind energy provides clean, sustainable electricity while grazing, dry-land and irrigated farming can continue as they have for over 100 years, benefiting the landowner and supporting the goals as stated in the county comprehensive plan," he said. Kurt Myers, staff engineer for the Idaho National Laboratory's Biofuels and Renewable Energy Technologies department, has studied wind energy for the past 12 years, and he also feels the resource offers several advantages. "Wind energy can provide for fossil fuel savings and stretch fuel supplies," he said, adding that the energy price is relatively steady, once the installation is complete, and can even help buffer other energy price spikes. "( And) long-term environmental impacts are typically much less than most other forms of energy." Evens so, wind isn't as energy dense as some of the other resources, Myers said, and it's not as reliable or easy to use, though it can be done. "There is no silver bullet yet for energy, so in my opinion a combination of lots of resources will have to be used for a long time into the future," he said. "The one thing I (know) is that wind will be around forever, but fossil fuels will eventually diminish to insignificant amounts if we continue to use them at higher and higher rates." Although landowners can still farm around wind turbines , many residents say they don't like the looks of the machines and are afraid they will impact their property values. They also have concerns about the safety of being around the machines as they get closer and closer to homes. Travis Stone, energy resource manager for the Shoshone-Bannock tribes, said tribal members have mixed feelings about the possibility of building a wind farm on the reservation. Although it could generate cleaner energy along with money and jobs, they're concerned about the potential impacts to their properties and animals living in the area, he said. Many eastern Idahoans have expressed similar concerns over the years. Tauna Christensen, a resident of Goshen, said one of the 27 wind turbines approved in Bingham County at the request of Blue Ribbon Energy -- though the decision is now under judicial review after nine landowners, including Christensen, took the matter to court -- could be located about a half a mile from her home. She doesn't want it there, but has agreed to consider negotiations because she can't afford to keep fighting the battle in court. Still, she's frustrated by east Idaho's changing landscape and doesn't believe there is enough independent evidence out there to prove the advantages, especially since the energy can only be used when the wind is blowing. "A lot of citizens have been propagandized about it being free and clean, but they don't know how expensive it is," she said. "I want independent, objective, real-world figures, and I want to see what we're doing (and make sure we're on a) path that makes sense." She also feels it is unfair that counties can decide whether or not to approve a development that can cause everyone's power rates to go up, and believes that decision should be moved to the state level. Although Williams knows that wind farms often come with controversy , he believes there are opportunities to mediate residents' worries and still take advantage of the wind blowing through east Idaho. He said the Rockland Wind Farm worked hard to address public concerns; officials moved the turbines farther back than the county's setbacks required and even voluntarily eliminated 7,000 acres from the project to ensure the turbines didn't interfere with bald eagles living in the area. "Ridgeline energy has spent over 10 years developing Rockland Wind Farm, conducting extensive environmental, cultural , avian, sound, visual and economic studies. We take the concerns and comments from our neighbors very seriously and will continue to do so," he said. "Listening to our neighbors , incorporating their ideas where we can, and answering their questions is a fundamental part of designing a facility like this." Blowin' in the Wind; What's the Future of Area Wind Farms?